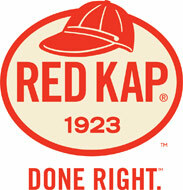 Red Kap® is the largest manufacturer of work clothing for men and women in the United States and is the benchmark for quality, durability, and selection in industrial uniforms. Working Class Clothes is a leading supplier of Red Kap® work pants, work shirts, coveralls, jackets & hi-visibility work clothing. Our specialized apparel includes Bulwark flame resistant clothing, The Force security & police apparel & Chef Designs restaurant apparel. We are open to the public. You do not have to login to shop or buy clothing. © Working Class Clothes, All rights reserved.